The ancient settlement of Petra is probably the most enduring image of Jordan. The rosy, wind-sculpted sandstone city lay hidden to the wider world for many centuries before being rediscovered in 1812 by an intrepid Swiss explorer; it was one of the best and most famous discoveries of the time but had likely been left to stand empty since the middle of the 7th century. 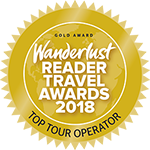 Each year, nearly 800,000 visitors come to this remote corner of the Jordanian desert to view the incredible spectacle for themselves – it’s so well recognised, it was even voted one of the ‘new’ Seven Wonders of the World in 2007, and it’s one of the world’s most treasured UNESCO Heritage Sites. 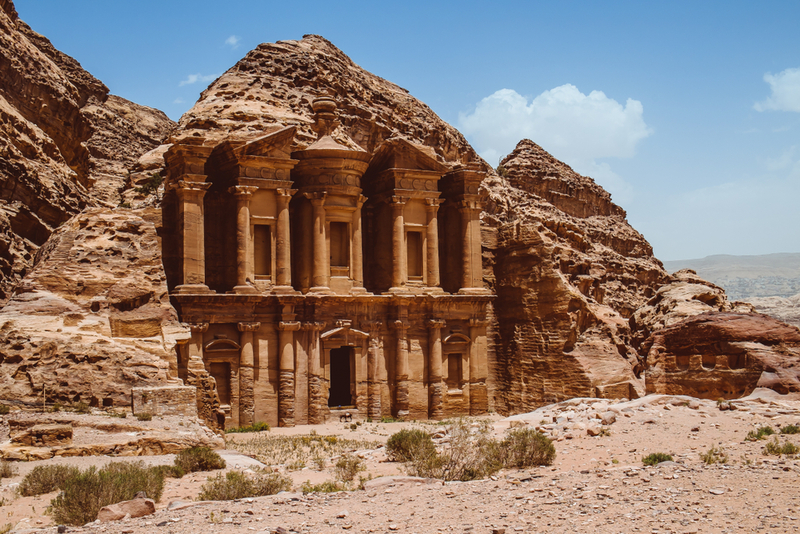 Being an easy drive from the capital city, Amman, and the popular visitor sites of Wadi Rum and the Dead Sea, Petra is a must-visit stop on holidays to Jordan, but what will you see once you arrive at Petra? Read our guide to help you discover what you might discover when you arrive on your holidays in Petra, one of Jordan’s most iconic sights. Petra was believed to have been built as the capital of the Nabataean Arabs in approximately the 1st century AD, when it flourished as a main trade centre for frankincense, myrrh and spices. Though its actual beginnings aren’t definitely known, it is believed that the land has been used by humans for over 10,000 years. Petra is one of the most famous archaeological sites in the world and is located in a key strategic position between the capital, Amman, and the Red Sea resort of Aqaba. The city later became a part of the enormous Roman Empire, though after being partly destroyed in an earthquake and with changes to the trade routes, the city was later abandoned and became deserted. For many centuries, this beautiful city lay forgotten from the rest of the world and was only known by the local Bedouin tribes from the area, who talked of their city with great pride. The Swiss Explorer Johannes Burckhardt set out to rediscover Petra in 1812; while travelling towards Cairo, he heard great tales of an ancient, ruined city hidden along a narrow valley, near the supposed Biblical tomb of Aaron, brother of Moses. Telling his guide he wanted to make a sacrifice to Aaron, he was led through the passage known as the Siq and became the first modern-day European to view the once-forgotten city of Petra. 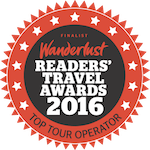 Since its ‘rediscovery’, the city has drawn visitors from all over the world to view its incredible tombs, theatre, streets and churches. In 1985 the city was designated a UNESCO World Heritage Site, ensuring its protection for many more centuries to come, and in 2007 it was chosen by popular vote to be one of the World’s New 7 Wonders, alongside other famous sites like the Great Wall of China and the Taj Mahal. What can you see at Petra? When Johannes Burckhardt visited Petra in the 19th century, he was not warmly welcomed by the indigenous tribespeople. He was required to dress in disguise to attempt to blend in with the Arabic people, speaking in a local dialect to help gain the trust of the Bedouins who guided him through the desert. These days, however, visitors on their holidays in Petra from all around the world are warmly welcomed by the modern-day Bedouin who still live and work in the desert and make the ancient city their home, as well as in the neighbouring city of Wadi Musa which has more contemporary facilities and traditional home comforts. 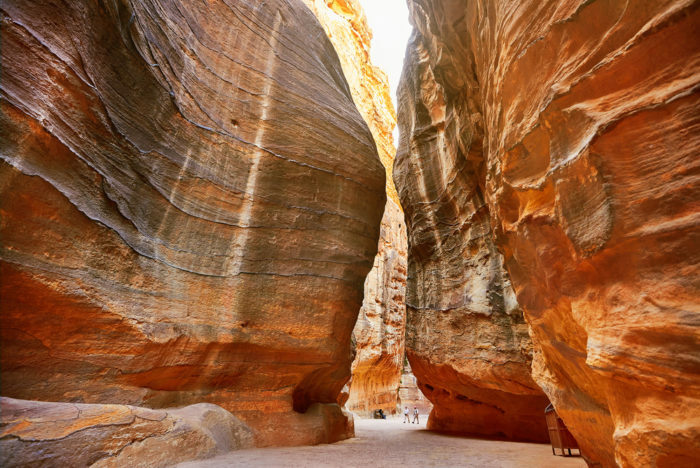 As well as the main site of Petra, there are a number of satellite attractions that can extend your stay, as well as a number of hiking opportunities (perfect for Jordan trekking holidays) in the surrounding desert. We would recommend a minimum of two days to make the most of your stay, though holidays in Petra can easily be added on to any Jordan trip. Most visits to Petra begin with a walk through the Siq. The narrow canyon is a former watercourse with near-vertical walls towering 200 metres above you. It runs for 1.2 kilometres, beginning beside a modern dam which prevents floodwater from the city flowing through the Siq. 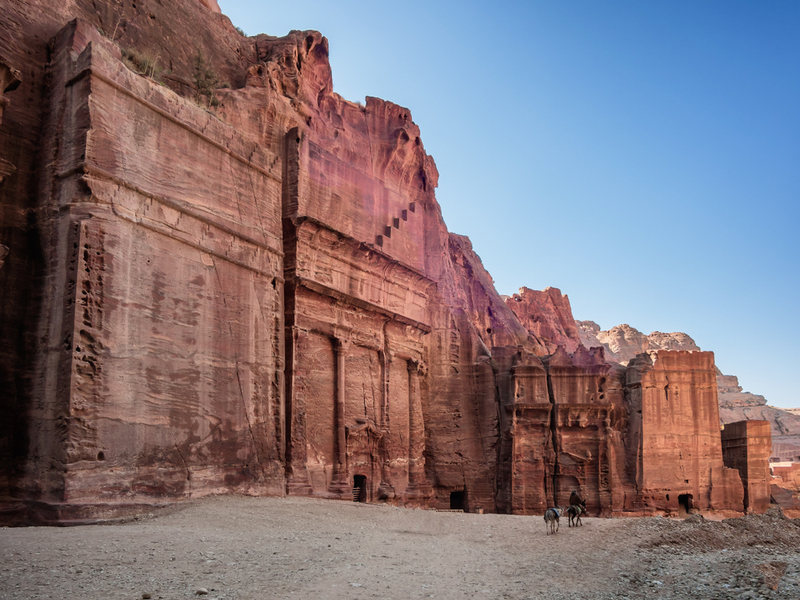 The entrance was once marked by a colossal Nabataean arch – its remains can be seen on either side of the entrance – and the 2,000-year-old terracotta pipes once used to bring water into Petra can still be viewed. The stone corridor is worth taking its time over to view many of these curiosities, and savouring the experience means your eventual arrival is even more exciting. The Siq is magical for more than just its end destination at the ancient city, for it was not carved by water but instead rent apart by tectonic forces. At some points, the Siq narrows to under two metres wide, where the light almost seems to disappear overhead; at another, you’ll see a small, square tomb and a lone fig tree, or carvings of camels and caravan men. Your introduction to the ‘rose city’ is just a small taster of what lies ahead. The magnificent façade of the Treasury, known as Al Khazna, is perhaps the most famous photograph of Jordan and is carved from sandstone. Its original function remains a mystery – many believe it to be a temple, or a place to store official documents. The popular belief is that the front of the Treasury was built as a tomb for the Nabataean King Aretas, and that it takes its name from an Egyptian pharaoh who once hid his treasures within, however the intricate monument is empty inside; like all of Petra’s rock monuments, the outside does all the talking. 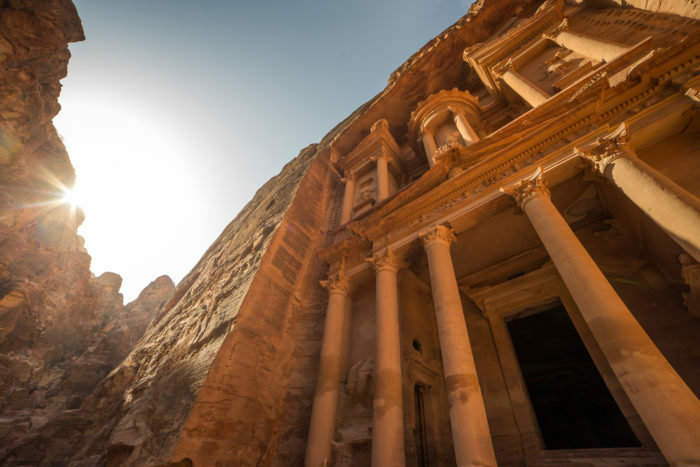 We’d recommend you start your exploration of Petra early to make the most of the sunlight, as the Treasury is best seen between 9am and 11am when it is in full sun. 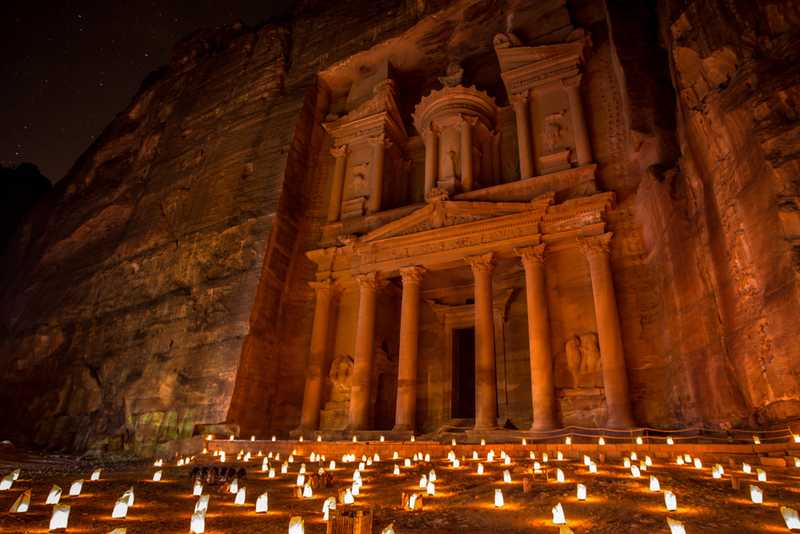 Alternatively, you can also return after dark to enjoy Petra by candlelight – a truly atmospheric experience. Walking through a lantern-lit Siq, you’ll emerge in front of the Treasury lit by flaming torches, where you’ll be serenaded by local musicians. As you leave the Treasury behind, you’ll walk into the broader passage referred to as the Outer Siq. 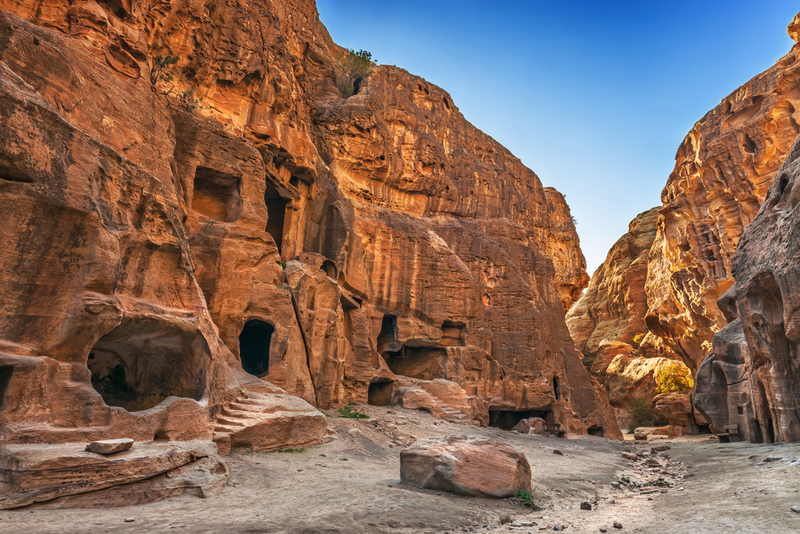 Here there are more than 40 tombs and houses built by the Nabataeans, known as the ‘Street of Façades’, and unlike many of Petra’s tombs, they are easily explored. Some of the tombs have funeral chambers in the upper storeys, while others have fortress-like roofs built in the traditional ziggurat style. It’s well worth a visit to compare the differences in architecture. 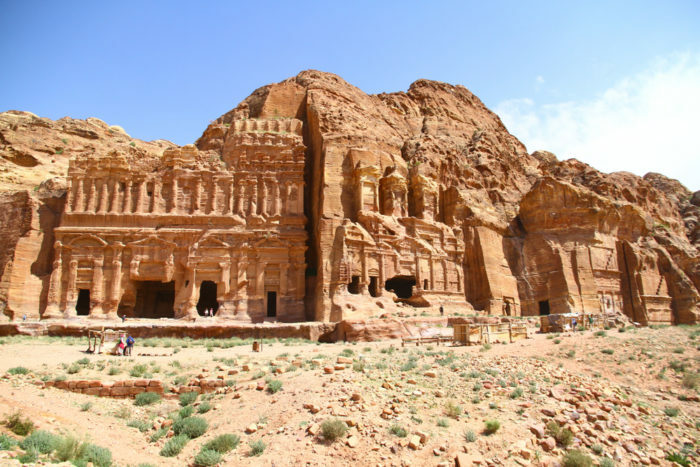 Perhaps second to the Treasury, the Monastery is another of Petra’s most famous monuments. It is similar in style but on a much grander scale: some 47 metres wide and 48 metres high. The Monastery dates back to the early 2nd century AD, and in later years during the Byzantine rule it was repurposed as a Christian chapel, hence the name. To reach the Monastery, you’ll need to climb the ancient processional route of rock-hewn steps up into the hills. On arrival you’ll emerge into a courtyard, once surrounded by many columns and used for important ceremonies. It’s a two-and-half hour walk from the Monastery to Little Petra, if you want to extend your Petra tour. 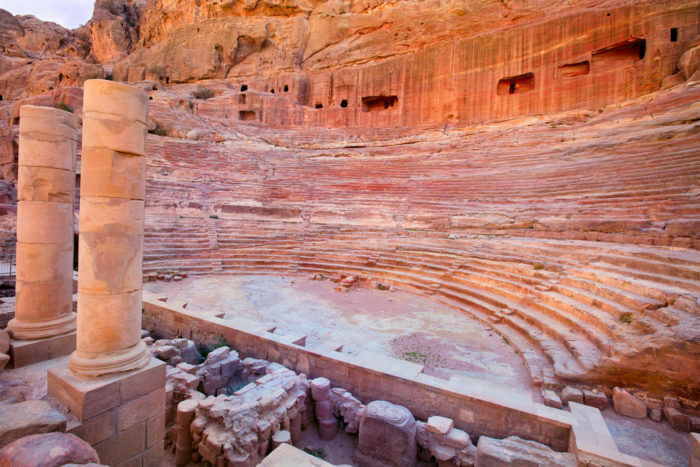 The Theatre was built more than 2,000 years ago, by the ancient Nabataeans rather than the Romans who later occupied Petra. Like the rest of the site, the Theatre was chiselled out of the rock and then later enlarged to hold around 4,000 people by the Romans, who also rebuilt the stage walls. The site was damaged by an earthquake in the 3rd century AD, and due to its extensive damage, it was dismantled in places to build other structures. In its heyday, the Theatre had a three-storey stage and 45 rows of seating: you can still imagine the fantastic displays that would have been performed here. Heading away from the Theatre you will discover the Royal Tombs, some of the most impressive you will see during your holidays in Petra. During sunset is the best time to visit, when the rose-coloured sandstone is bathed in golden light. A series of steps leads from the valley floor, and the hike up to the top offers amazing views across the Treasury. It was under the pretext of visiting Aaron’s tomb that Johannes Burckhardt convinced his guides to take him into the ancient city of Petra. The brother of Moses was believed to have been buried at Jebel Harun, known as the Biblical Mount Hor. The tomb is simple: built in the traditional Islamic style with a whitewashed dome that was added in later years but holds an ethereal beauty. It’s a lengthy walk beginning in Petra, but the towering paths that lead here offer stunning views around the surrounding mountains. Situated five kilometres from the main area of Petra, Little Petra was believed to be a retreat for noble and wealthy Nabataeans – its ancient name is Siq Al Barid. It really is like a Petra in miniature, with scaled-down streets reminiscent of the ancient city and even a short, narrow entry canyon just like the Siq. Within Little Petra there are tombs carved into the rock, remarkable cave paintings and even a path leading out of the back to a ledge with captivating views. Should you wish to make a visit to Petra via the little-used back entrance on your holidays in Petra, you’ll start at Little Petra. It’s known as ‘Petra’s Secret Back Door’ and is worth considering if you’re planning a longer stay. You’ll enjoy a dizzying walk into the mountains, crossing voids and enjoying spectacular views – you’ll need a head for heights for this one. Setting off early in the morning means you’ll reach the Monastery long before any other guests, with only your local Bedouin guide to accompany you. Because Petra is in a convenient location at the heart of Jordan, it is easy to tie on a visit to another of the country’s fabulous sights during your holidays in Petra. Three hours to the north is Amman, so it’s possible to drive there on a short break, or the salt-ruffled shores of the Dead Sea, with its plentiful spa hotels. 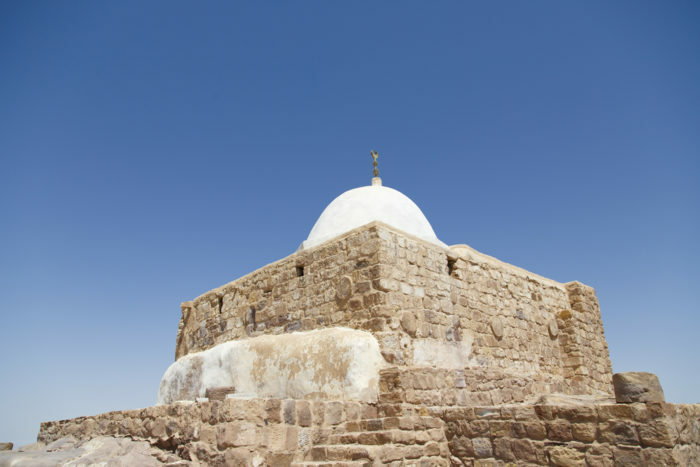 On the way back to Amman you can travel along the King’s Highway, stopping at the mosaics of Madaba, at Mount Nebo for the views, and the Crusader Castle of Kerak. 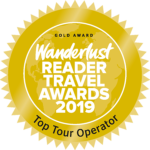 To the south are the otherworldly desert landscapes of Wadi Rum where you can take a jeep tour of the dunes, and the Red Sea resort of Aqaba, which has famously good diving. Jordan holidays offer you an amazing selection of sights, and Petra is certainly the most impressive of its treasures. 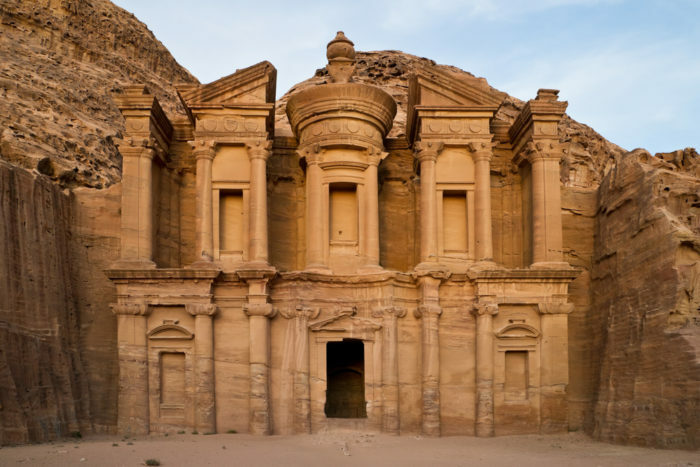 Contact our resident expert Catherine to discover more about this incredible historical monument and start planning your perfect holiday in Jordan. 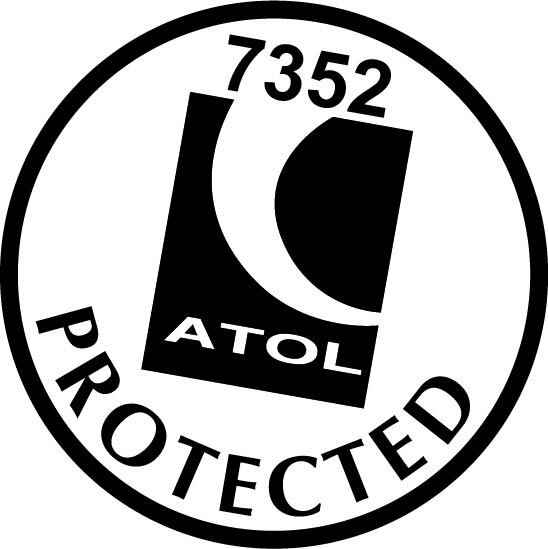 Part of A&D Holidays Ltd, Eighth Floor, Eagle Tower, Montpellier Drive, Cheltenham, GL50 1TA, Registered in England company number 7261883.